Imagine the scene: England just after the time of King Arthur. Knights still roam the land, and the Angles and Saxons still want to clobber each other. Axl and Beatrice, an elderly couple, can't shake a feeling of malaise. They feel compelled to leave their village to search for their son, but their memories are so fleeting and impermeable that it's hard for them to remember much from the present, let alone the distant past when they think their son left the village. Along the way, they encounter all kinds of fantastical creatures-- dragons and warriors and ogres, and spend quite a bit of time with Sir Gawain, and often find themselves sidetracked on their original quest to find their son, instead focusing on their relationship and lost memories. The Buried Giant is the kind of book that makes me feel pretty stupid for not enjoying more. I listened to the entire book, which I think helped, since it's the kind of story that I would probably skim, finding it difficult to find a footing with the text. 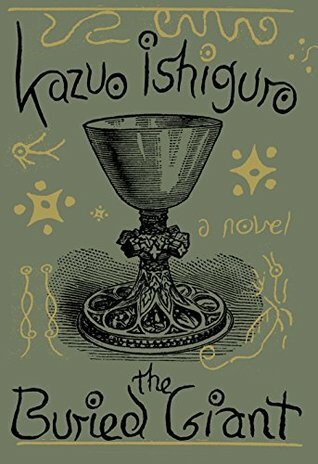 I respect Ishiguro as a writer enough to know that he's saying a lot about our contemporary society with this fable, and I think I was able to see a lot of the connections he seems to want to be making, particularly when it comes to making memories and feeling guilt. I wanted the narrative to grab me more than it did, and felt myself plodding along out of respect and duty more than enjoyment. I also pegged the last scene, involving a ferryman, the first time we encountered the ferryman hundreds of pages earlier, which made me a little disappointed that Ishiguro didn't surprise me more. If it makes you feel better, the NY Times reviewer felt similarly about this book. It was a review that basically said that while he respected Ishiguro for writing this story, he didn't enjoy it much. It sounded like kale. Good for you yes, delicious - definitely not. I have been waiting for your review. I am having a hard time convincing myself to read this book. I just finished this book a few days ago and felt just like you did. I've not read any of his others, but love the movie version of Remains of the Day. I might have to give him another chance. This sounds awesome. I must add it to my TBR list. Thanks for the review and author love. I've never read this author.